WWW, December 2009 - If only because of African Anthem alone this album should be considered a clasic, but the fact that this is the Deluxe edition makes this another must-have for every self-respecting collector of the better (DUB) Reggae music. The subtitle of this album is not there for nothing: especially in the first ten titles, the original African Anthem album, it's jingles and soundeffects galore. 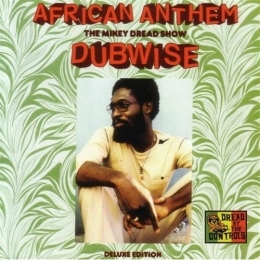 This is indeed The Mikey Dread Show avant la lettre, as the album should really be played from start to finish and the jingles gives us the idea that we're listening to one of the best Radio Stations in the universe. As said: the original release only contained the first ten titles. This release comes with 5 bonus track, among which an extended version of JBC Days/Proper Education Version and some more heavyweight material by the man we will never forget: Michael "Dread At The Controls" Campbell aka Mikey Dread. There are three titles from this album avaialbe for free and legal download straight from their Dubroom MP3 download pages. Click on the titles to visit them.